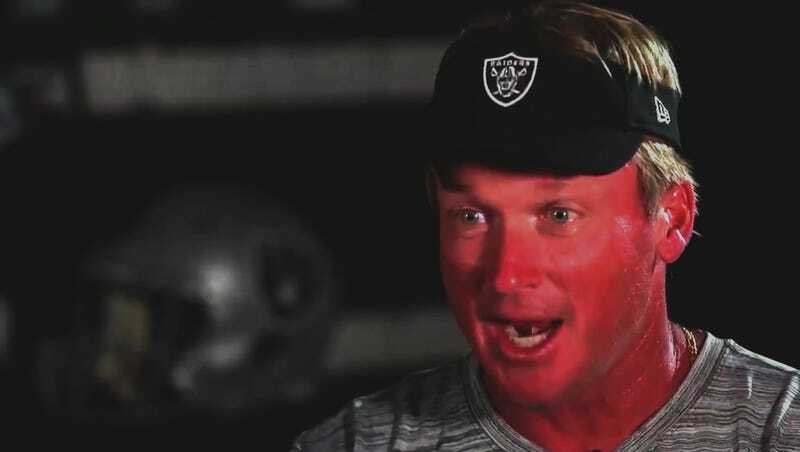 Alert, alert, this is not a drill: Jon Gruden’s redness is about to reach dangerous levels. Be prepared for sudden shifts in hue, and please do not look directly at him. This is remarkable insofar as this type of overt second-guessing rarely happens in the NFL, even anonymously, and usually not in the first season of a head coach’s tenure. It typically takes years of incompetence and sub-.500 records for players to start grousing about the people in charge. It only took Gruden seven weeks to get here! The man is incredible. There are plenty of other spicy quotes in The Athletic’s piece, including one player admitting that a lot of guys are basically just waiting around for the season to end because they assume they’ll be jettisoned before next year. What a great sendoff the fans in Oakland are getting.